We are now moving into the top 3 plays on my Best Offensive Plays in Youth Football play list. The Spread 2MO Jet TB Sweep is a great play if you have a fast running back, especially if they have a little trouble getting up to speed. The motion lets them get moving so when they receive the football they can hit top gear, hit the edge, and score. In combination with a QB / FB dive and or a X-Seam pass option this play is deadly. I love to run this play when one of my opponents has decided to stack the middle box and put a weak corner outside. There is no hiding this play because you can see the motion coming so its speed against their edges. I always try to call this play to the wide side of the field so we can use the whole field to get to the edge and turn it up. The play starts with the #2TB in motion and then a direct snap to the QB so the TB and QB mesh at almost receipt of the football from the Center. I have my QB boot to fake a waggle pass backside to keep the defense honest. Blocking is Severe Angle Blocking playside and we try to pull the backside OG. The WB and TEX will combo on the DE and release to OLB and FB fakes the dive and hunts the CB. I like to Double team the DE in youth football because he is normally a top player on the defense. If we can get the DE blocked we can certainly make a high percentage run for the edge. The TB once securing the football from the QB looks for the edge with his eyes up looking for the DE and CB blocks. Once the TB sees a clean running lane he cuts up field climbing the stairs to inside the numbers and then the goal line. I personally like my Jet Sweepers to get very wide before turning up. Use the speed if you have it. Why give the other team a chance to catch you by turning up to early? And it has been my experience youth football running backs want to cut back to the middle and we do not want this on the Jet Sweep. If the defenses start smelling out your Wide Jet Sweep then turn it into a Gut Jet Sweep or a Cut Back Jet Sweep. These two variations really mess with the defense. I hope you like the Spread Jet Sweep. Do you run it or something similar? I would love to hear from you. Leave me a comment or email me. I ran a fly offense for 9 year olds this year and made it to the championship. Although we lost to a more physical team, I feel we would do better with this type of offense if we ran it from the gun. 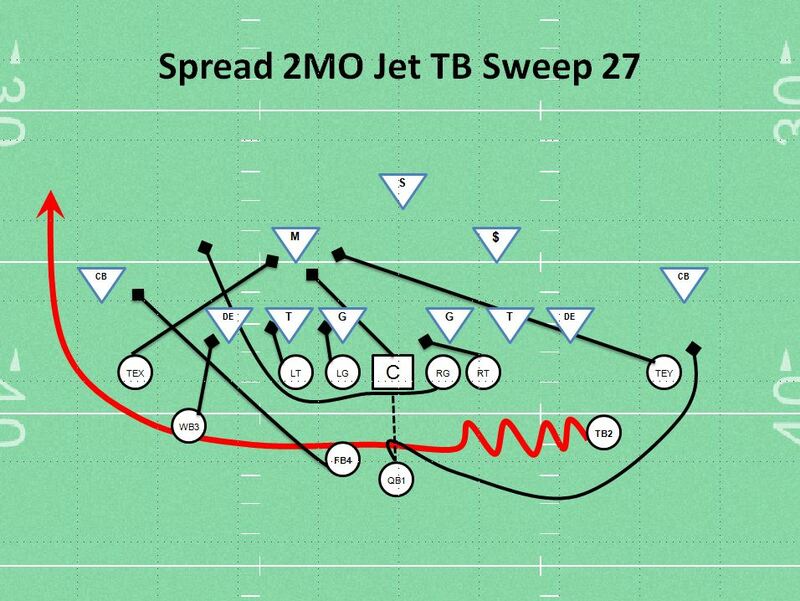 Do you have a video or play book on the spread jet mo offense. I would like to run the jet motion but add the threat of passing with my 10 year old team next year. We ran something very similar to this but we ran with 3 wr and a te. When they started sniffing out the sweep we would quick snap and obliterate the de with the motion man and sweep or option behind that block. Really messed with the defense. We ran this for our 11-13 year old team – but had problems with it. We had a very soft O-Line and the defense walked right through and caught the Wing as he came across the backfield. Sometimes the opponent would break through and take the ball from our QB. The problem is not the play design, but you need some players to block even momentarily at the line of scrimmage. Our alternative was a very quick dump pass to TE just one or two steps over the line – while the defense over pursued. I will continue to look around on your site for more ideas for teams with soft O-Lines. Great site and good dialog… thanks.